■ To remove: switch off the lights. ■ Turn the front wheels inwards. ■ Remove securing pin 2 using a suitable tool. ■ Slide cover 1 up and remove it. ■ To install: insert cover 1 again and slide it down until it engages. ■ Insert securing pin 2. They can explode when being changed if: • they are still hot • they hit an object when being removed • they are dropped There is a risk of injury. You should wear eye protection and clean gloves when you are changing a bulb. If necessary, have bulbs changed at a qualified specialist workshop. 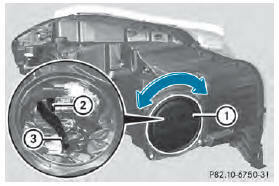 ■ Remove the cover in the front wheel housing . ■ Turn housing cover 1 counter-clockwise and pull it out. ■ Turn bulb holder 2 counter-clockwise and pull it out. ■ Take the bulb out of bulb holder 2. ■ Insert the new bulb into bulb holder 2. 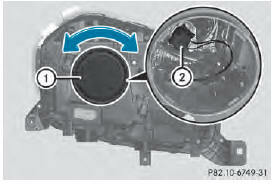 ■ Insert bulb holder 2 into the lamp and turn it clockwise. ■ Align housing cover 1 and turn it clockwise until it engages. ■ Replace the cover in the front wheel housing . • they are still hot • they hit an object when being removed • they are dropped There is a risk of injury. ■ Switch off the lights. ■ Pull lever = upwards and remove bulb holder 2. ■ Simultaneously press bulb holder 2 and pull lever 3 downwards.